166 pages | 12 Color Illus. Branding is a profoundly geographical type of commodification process. Many things become commodities that are compared and valuated on markets around the globe. Places such as cities or regions, countries and nations attempt to acquire visibility through branding. Geographical imaginations are evoked to brand goods and places as commodities in order to show or create connections and add value. Yet, not all that is branded was originally intended and created for markets. 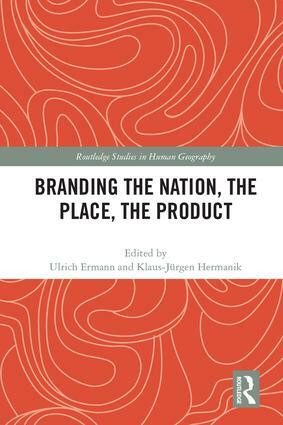 This volume aims to broaden current understanding of branding through a series of contributions from geography, history, political studies, cultural, and media studies, offering insight into how ordinary places, objects and practices become commodities through branding. In so doing, the contributions also show how nation, place and product as targets of branding can be seen as intertwined. To discuss these forms of branding, book chapters refer to states, cities, holiday destinations, food malls, movies, dances, post stamps and other items that serve as brands and/or are branded. The book will be of interest to students and scholars in geography, sociology, history, cultural studies and business studies who would like to gain an understanding of the intricate and surprising ways in which things, places, and cultural practices become brands. Ulrich Ermann is a professor in human geography at the University of Graz. His research interests lie at the intersection between economic and cultural geography, exploring geographies of consumption and production, and commodities and brands. He conducted research on local food in Germany and Austria and fashion brands in Bulgaria. Klaus-Jürgen Hermanik, Priv.-Doz. Mag. PhD, University of Graz, is an associate senior researcher at the Centre for Southeast European Studies and at the Institute of History. In the larger frame of cultural studies, his research and teaching focus on identity-management, minorities, nation branding, and memory studies.